Choose from either 1/2 lb. of plain maple (most popular), maple walnut, plain chocolate, chocolate walnut, or peanut butter fudge flavors. 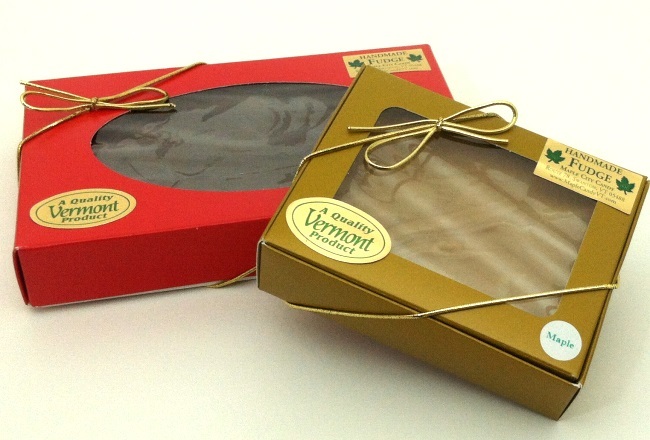 We dare say that when it comes to Vermont gifts, maple fudge is a great choice. Fudge gifts have been a customer favorite in our candy store for years. Creamy and delicious, with real maple flavor and the crunch of walnut... YUM! Our fudge is packaged in a food safe 1/2 lb. plastic tray with sealed plastic tear away top, then slid into the decorative gold box and lastly, packaged in a shipping box for fast Priority Mail delivery. For a look at the gold gift box, click on the chocolate fudge image to enlarge. Choose Fudge Flavor: Plain Maple, 1/2 lb. Maple Walnut, 1/2 lb. 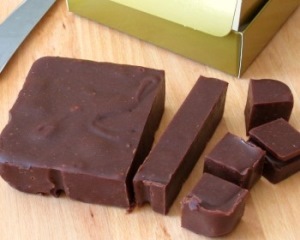 Plain Chocolate, 1/2 lb. Chocolate Walnut, 1/2 lb. Peanut Butter, 1/2 lb.